Part of the chancel is C11 and the nave, tower and south aisle are late C12. The chancel was lengthened in the late C13. In the C19 north aisle is some reset early C16 work. The church stands on the north side of Stane Street, the Roman road from Chichester to London. A church is mentioned in Domesday Book (11, 105) and at least the south west wall of the chancel, which is deflected to the south, remains from this period. 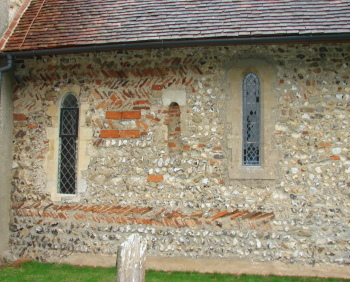 It is built of mixed flint and re-used Roman brick, arranged in herringbone courses. Such work could date from either side of the Conquest, but the neatness of the herringbone points to the later C11. A round-headed chancel arch, also of re-used Roman brick, lasted in part at least until 1867. Some bricks are patterned and some hollow ones are probably from the hypocaust of a building near the road. A distinctly redder type of brick was probably used during the initial construction and not during later repairs, as Fisher suggests (p211). A blocked small window, its head formed of a single stone, remains and one from the former north wall has been reset. The date of the nave cannot be established for sure, though the Roman brick present in the C19 north aisle probably comes from the north wall of the nave. The most likely date is thus also the C11 and support for this comes both from the dimensions and from a length of wall which remained west of the late C12 south arcade until 1867, suggesting it was inserted in an older wall. At the eastern end of the arcade is the tower and the easternmost bay, of which there were originally three, opened into it. The similarities with the contemporary work at Boxgrove nearby are unsurprising as the church passed to the priory in the early C12 (VCH 4 p179). A complex cruciform pier, with clustered shafts and bell-capitals, supports the tower and links its arch to the arcade proper; the others are round with scallop capitals. 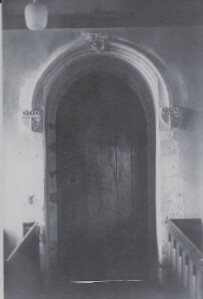 The smaller tower arch is similar but with a stepped head, whilst that from the tower into the aisle has on each jamb a single demi-shaft. Though restored, the tiebeams and crownposts of the roof may date from this time, as may parts of the plain south doorway in the otherwise reconstructed aisle. The tower is slender, with low buttresses and two lancets, not quite in line, in its lower parts, which look late C12. The Burrell Collection drawing (probably 1782) shows a timbered top stage and a steeper spire. 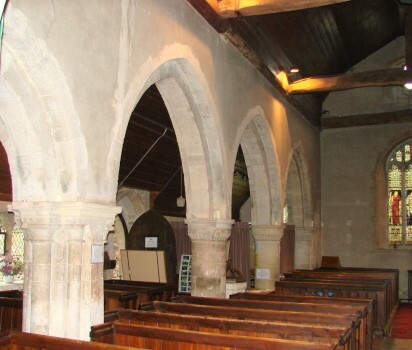 Later in the C13, the chancel was lengthened, as the side-lancets show; the two either side of the original south opening are partially renewed, but represent what was there before (the westernmost one is a lowside), whereas the single one to the east is not visible on the undated Sharpe collection drawing, though its position is likely to be old as its high sill is determined by the presence of a piscina inside. To the north only a lowside with a shouldered head remains. Though repaired, the opening of the east window is old and the quatrefoil head is in later C13 style. Something broadly similar is shown on an engraving in The Gentleman’s Magazine (1832 Part I opp. p577), though the head contains what looks like a blocked oval. The restored C14 cinquefoil-lancets at the east end of the north aisle are as seen in the north aisle on the Burrell drawing. The Sharpe drawing shows the west end with a C15 panelled window and a quatrefoil gable-opening as today, so these were accurately renewed, either in 1840 when the west end was rebuilt (see below) or in 1867. The reset west window of the north aisle and its north doorway, now to be seen inside, are early C16. The Burrell drawing of the north side shows them almost adjacent. Both are round-headed and the heraldry confirms the date of the doorway. The label has shields with the arms of Ryman and Tawke, of whom the latter held a manor in the parish (VCH 4 p178). They are arranged as stops and, less usually, at the apex as well. The window has mullions with downward facing cusping in the head; it is renewed, but accurately. The VCH argues it is C14, but doorway and window seem of a piece and both show an awareness of early C16 north European forms. 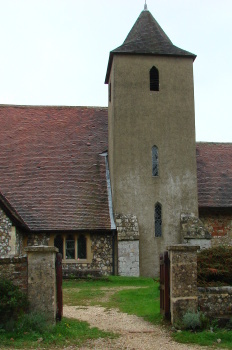 There are other instances in Sussex (e g Brede, East Sussex), but the de la Warr chantry at Boxgrove, with its link to Westhampnett, provides the obvious link. There was little work after the later C16 until the chancel roof was rebuilt in the early C19 (1 p35). In 1831-32 the church was re-seated; the plans accompanying the ICBS application are signed by W Brooks as surveyor and one —- Pelham, who was presumably the builder. In 1840 the dilapidated west end was rebuilt (ICBS), though it is unclear how thoroughly this was done, and in 1848 unfulfilled plans for enlargement to the designs of J Elliott (personal communication from Bob Cutts) led to an enquiry of the ICBS. 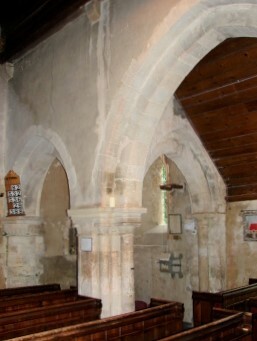 Probably in 1840 at the latest, the C11 chancel arch was cut back to improve visibility (1 p34). 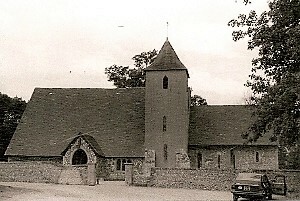 However, it was in 1867 that G M Hills gave the church its present appearance. He was proud enough of his work to publish the same article about it twice (see 1), but it can only be regretted, no matter how much the fabric had previously been damaged. He added a north aisle, with an arcade based on the south one, but with shafts like the tower arches, and a further arch west of the south arcade, re-using the west respond. His chancel arch resembles the arcade, but is more florid, with heavy triple shafts and foliage capitals. He rebuilt the south aisle and porch, though he kept the lean-to roof. Most of his work is in hard galletted flintwork. In the chancel he renewed the roof and replaced most fittings and the top of the tower is his, though the cement render which conceals the join with the older work is out of character. In 1880, when an organ chamber was added to the chancel, the C11 north window was reset (Peat and Halsted p171). Font: Small octagonal bowl with an oddly formed base that curves outward, like the pointed leaves at the top. It is probably C17 or later. 1. (East window) Clayton and Bell, 1867 (Peat and Halsted p171). The use of blue is characteristic. Monument: (North chancel) Richard Sackville (d1535) and his wife. One of a type of tomb found in the Selsey area and intended as Easter sepulchres. The arched canopy has a restored moulded head with the family arms on the chest. Sackville and his wife kneel either side of a mutilated Trinity. Niche: (East wall of tower) C15 with a cinquefoiled head. Piscina: (South chancel) Large C13 trefoil-headed double piscina with a renewed shelf.